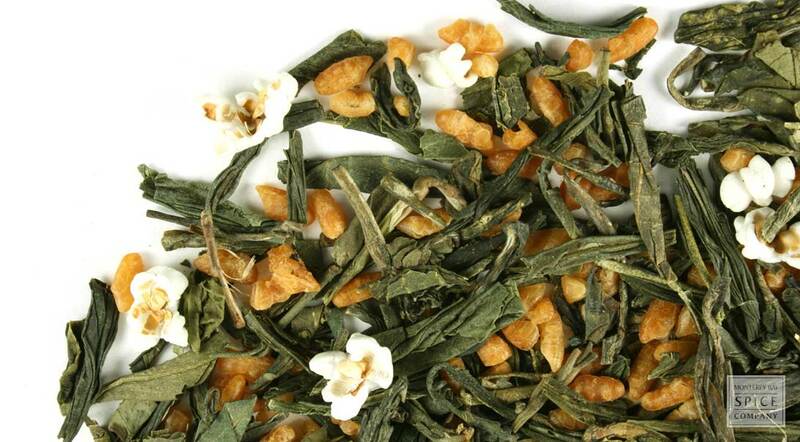 Genmaicha is the name for Japanese green tea that is mixed with roasted brown rice. This genmaicha is created using bancha green tea, a Japanese green tea that comes from the same plant as Sencha green tea, but is plucked later in the season. In addition to toasted rice, some popped pieces of rice provides an additional nutty taste that, when coupled with the sensual tanned brew of the bancha, creates a unique savory flavor! tea type Green tea blend. infusion method This genmaicha Japanese green tea is made with a base of bancha tea. Bancha is often comprised of the shoots just below the top shoots used for (sencha) tea (it can also be the second harvest of the tea plant). The leaves are a simliar size to sencha and will steep faster than larger leaf teas. The inclusion of toasted rice makes the infusion of genmaicha more forgiving, since this will often mask any bitterness from accidental oversteeping.